In October 2006, Funderburg and Cribbs set out to watch at least 200 movies over the course of the next 200 days. They both watched a different slate of films and wrote about every single one; from epic high art masterpieces such as Jean-Pierre Melvile's Army of Shadows to half-forgotten oddities like I Bury the Living to quality-deficient garbage like Charles Band's Tourist Trap. The Pink Smoke is reprinting their writings about the grueling experiment in cinematic endurance - due to the length of the essays, some of the entries such as Berlin Alexanderplatz and Grindhouse will be broken out individually. 4.14 & 15. Berlin Alexanderplatz. If you actually intend on watching Fassbinder's dyspeptic 15 and ½ hour tale of a downtrodden ex-con struggling his way through Weimar Germany, the first question you've got to confront is: how do I watch the damn thing? Originally presented as a 14 part mini-series broadcast on West German television in 1980, the obvious choice might be to simply watch individually each of the film's hour-or-so-long sections (and feature length epilogue) – maybe even spaced out on a weekly basis as it was originally presented. 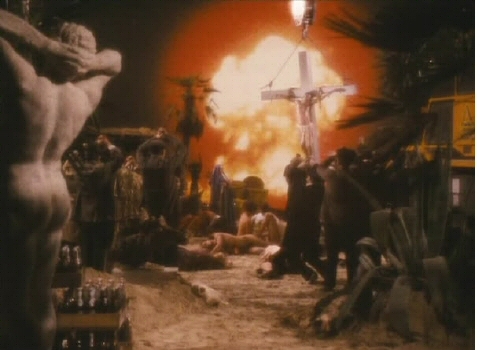 But aside from the statements Fassbinder made that he never really intended for the film to be watched in such fashion, the film itself immediately makes clear that the "episodes" aren't really coherent divisions – several of them end mid-scene, mid-sentence and the next episode then picks up at the exact moment the previous episode left off. Obviously, leaving a day or a week in between those pieces would somewhat derail your train of thought – what was Biberkopf saying last week before the image suddenly froze and the credits rolled? And conversely, I'm not sure I would recommend watching all 14 episodes straight through without any kind of break. First off, that obviously turns the screening into an endurance test; it makes the film into something you survive, not experience. Having survived a lighter version of that endurance test (I watched the film spread out over two days with frequent 15 minute breaks and a long 2 hour dinner break each day), halfway through the screening, it occurred to me the best way to ingest the ungainly behemoth: one should watch Alexanderplatz as one reads a novel. When you pick up a book (say, the source novel upon which this film is based), you don't expect to read it all the way through in one sitting. Nor would you stop at every chapter break and mechanically set it down only to then pick it up again after a prescribed interval. Most likely, you'd read as much as you could (or felt like) in one sitting, get through to the end of whatever chapter you were working on, and then pick it up again when you could. It might seem obvious now that I've laid it out; but if you're going to watch this film, that's the way you should do it. The main argument against viewing it in such a fashion, as far as I can see, is that the bizarre, feature-length epilogue would probably lose a great deal of it mind-bending, hallucinatory power if it didn't come at the end of a physically taxing marathon viewing session - that epilogue has to be one of the all-time great cinematic oddities: a metaphorical reiteration of the entire plot rendered in heavily symbolic, incongruously modern abstract sketches. With a soundtrack of Kraftwerk. On its own, I would imagine it's probably a bit tedious, but as a coup de grace delivered to the back of your skull after an entire weekend of Fassbinder indoctrination well, I now feel like I experienced the process that cult leaders use in those weekend retreats from which even skeptical initiates never return. 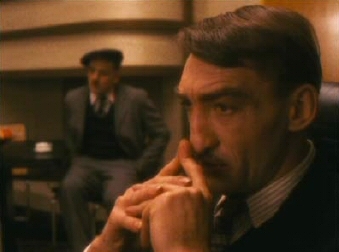 The movie itself functions like the rest of Fassbinder's filmography. I've often argued that Fassbinder never produced any individual masterpieces, but that his work was valuable in the context of the entirety of what he produced. I'm not sure his best films (In a Year of 13 Moons, The Merchant of the Four Seasons, The Marriage of Maria Braun) really measure up against the greatest cinematic masterpieces ever created – but Fassbinder's body of work overall is second to none. The small moments in his movies take on a cumulative force and refract off of one another in such a way that even his worst films are raised beyond a level of mediocrity – in other words, there's probably no such thing as a "flawless Fassbinder masterpiece" but the more of his films you see, the greater they all become. Alexanderplatz functions in a similar fashion: I'm not sure I would call any of the individual episodes great (unlike, say, Kieslowski's The Decalogue, which has individual episodes that stand out even compared against the other pieces of the overall fantastic series), but the totality of Fassbinder's project is breath-taking. His movies are always full of flawed elements: sloppy photography, wooden dialog, off-key performances, stretches of tedium, but the great stuff is frustratingly, hopelessly infused with the mess. I don't think it would have been possible for him to work any other way. * The towering, iconoclastic performances and devastating emotional gut-punches can't be separated from the dross and, I would argue, derive some of their power and peculiarity, some of their indescribable ineffable idiosyncratic genius from the failure and flaw with which they are bound. The weak passages and the strong passages are one and the same. Although, I don't necessarily mean that literally: the film opens with the weakest material in the whole expansive running time – the opening hour is a chore to sit through by any standard and there's not much good "inexorably interlaced." 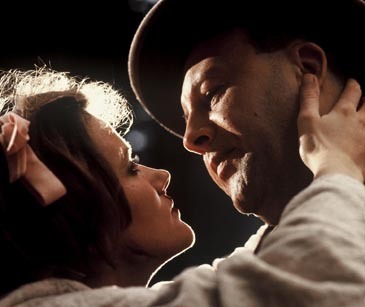 Fortunately, the strong passages in Alexanderplatz are as strong as they come – not just in the history of cinema, but of all art. Gottfried John's portrayal of Reinhold Hoffmann, the stuttering villain, deserves to be singled out: the writing and performance synthesize his thorough hate-worthiness with a genuine human sadness. It's one of the only characters that I can think of whose sheer awful villainy is never undercut, but whom manages to generate poignancy: he is a character that you hate the way you hate your own dark awfulness: the embodiment of all of the worst thoughts God knows you have, Hoffman is everything about humanity that is detestable, pathetic, and black. But the character is human. And the film won't let you ignore that terrible fact. 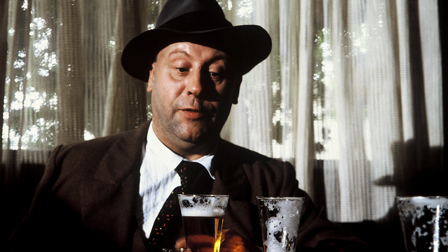 The movie hinges on Hoffman and, in fact, also hinging on that character is Fassbinder's obsession with how his parents and their fellow countrymen could become the Nazi generation. Surely, Germany in 1938 was not a historical anomaly. Clearly, it wasn't an event without precedent and with no chance of being repeated. Who were those people? Who were those Germans? Was Reinhold Hoffmann, in fact, a human being like any other? Ok, enough of that for now – it also needs to be mentioned that Fassbinder sees the flipside to that coin in Biberkopf's young love Mieze, played by the utterly charming Barbara Sukowa. Mieze is the rose of humanity, the naïve goodness that seems to spring up everywhere around us for no good reason at all. She's neither innocent nor pure - a prostitute in every sense of the word - but there's something undeniably good about her and something undeniably human about her goodness. The film's acidic irony is in its careful parsing of the intertwined fates of these two characters: its cold analysis is that you can't have Hoffmann without Mieze and vice versa. And so from there, the two characters' goodness and awfulness begin to blend together, fault and antagonism, self-awareness and self-deception, desire and resistance, practicality (social, financial, emotional) and romanticism blur over into each other, pulling our hero Biberkopf farther and farther under their torrents. The good and the bad blurring or, even better: interlocked like light and negative space – Fassbinder's epic mirrors his career.